US military investigators have flown to Iraq to study reports that marines shot dead at least 15 civilians, including seven women and three children. The incident is said to have happened in Haditha on 19 November 2005. The military's initial claim that the civilians died in a roadside blast was disproved by an earlier investigation. 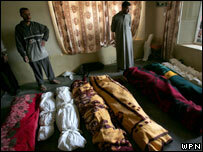 Investigators will now ask if the civilians died in crossfire or were targeted deliberately in a potential war crime. Iraqis often accuse US troops fighting insurgents of committing war crimes. Residents in Haditha, in the western province of Anbar, say the marines went on the rampage after one of their number was killed in a roadside blast and another two were injured. They say the soldiers began shooting dead the inhabitants of nearby homes and others from the area. A US military spokesman, Capt Lyle Gilbert, told the BBC News website "appropriate action will be taken if the investigation finds evidence of impropriety". 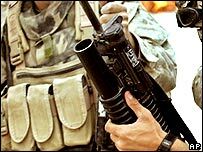 He said Iraqi insurgents routinely "put civilians in the cross-hairs" in order to turn public opinion against the US military. A military report at the time had said insurgents opened fire from all directions after the roadside explosion and the marines responded, killing eight fighters. In the report, the deaths of 15 civilians were blamed on the initial blast. Locals offered a different version of events, and the case was taken up by US news weekly, Time. Time reporter Bobby Ghosh told the BBC that a videotape, given to the magazine by an Iraqi human rights group, had shown the civilians "could not have been killed by a roadside bomb". "Their bodies were riddled with bullets," he said. "There was evidence there had been gunfire inside their homes, there were blood spatters inside their homes." The magazine says it presented its findings to the US military, which investigated the incident in January. The preliminary investigation established that members of two Iraqi families were indeed killed by the marines, though it described the deaths as collateral damage. Time says there is not enough evidence to show US soldiers deliberately targeted the civilians. Now the case has been referred for criminal investigation by the US' Naval Criminal Investigative Service to establish whether the 12 marines involved were guilty of misconduct. A spokeswoman for the US military, Lt Col Michelle Martin-Hing, told the BBC News website the video presented by Time magazine "doesn't tell the whole story". Lt Col Martin-Hing said the investigation will examine whether the marines violated any rules of engagement in the five hours they spent tracking insurgents, who were "moving through the town amongst homes, civilian residents, other structures and palm groves". Amnesty International has long accused the US military of failing to investigate adequately claims that its soldiers have killed Iraqi civilians. Separately, the US military has announced it will investigate allegations that its soldiers killed 11 people in a raid north of Baghdad last week. Iraqi police said five children and four women were among those shot dead by US soldiers in a house near the town of Balad last Wednesday. The military said at the time that it killed only four people in the raid, which is said to have targeted an insurgent linked to al-Qaeda. Lt Col Barry Johnson, a US spokesman in Baghdad, told Reuters news agency an investigation had been opened because of the "discrepancy" between the US and Iraqi police's accounts of what happened.